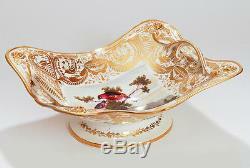 7614 Derby Porcelain Basket With Hand Painted Birds. 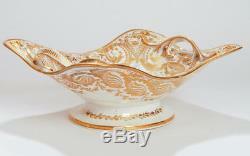 A superb early 19th Century Derby twin handled porcelain basket. It dates to the late Georgian period around 1820. 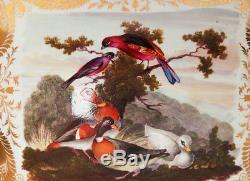 This lovely example has a large central reserve hand painted with birds. The the finely painted birds are almost certainly by Richard Dodson who was an expert in this area and they are very attractively done as you can see in the images. The body of the basket features extensive and elaborate gilt work over a white ground. 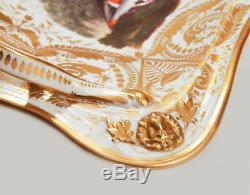 It is also gilded to the underside. There are moulded lion head masks to the corners of the basket. The Derby crossed baton mark in red is featured to the underside. A very showy piece which would make a great feature item. One corner has some professional restoration, this has been done very well and is invisible for all practical purposes. This corner is shown in close up to both the top and underside in the images for you. Fine all over crazing as typical for Derby of this period. 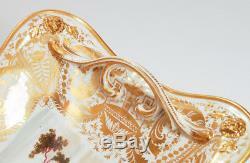 Gilt remarkably good for age with very limited wear. If for any reason you are unhappy with your item please let us know as soon as possible, and we will do our best to put things right. 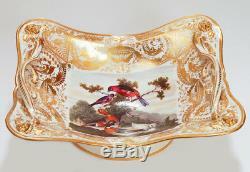 The item "A Large Derby Hand Painted Birds Porcelain Basket by Dodson, Antique c. 1820" is in sale since Sunday, July 20, 2014. 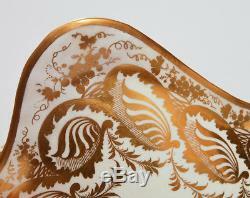 This item is in the category "Pottery, Porcelain & Glass\Porcelain/China\Royal Crown Derby\Decorative/Ornamental". 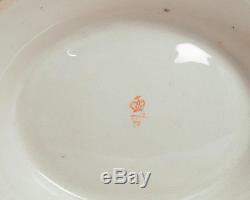 The seller is "chrisbuckman" and is located in Lincoln. This item can be shipped worldwide.